I love the look of a yo-yo. No, not the toy on a string, but a fabric yo-yo. 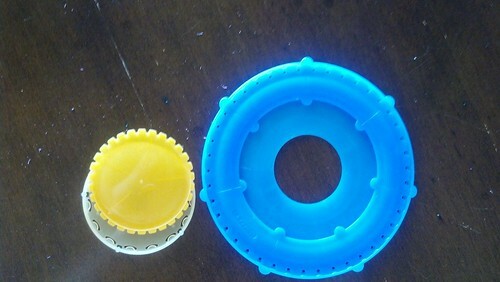 Just Google "fabric yo-yo" and check out all of the cool images and uses for yo-yos. 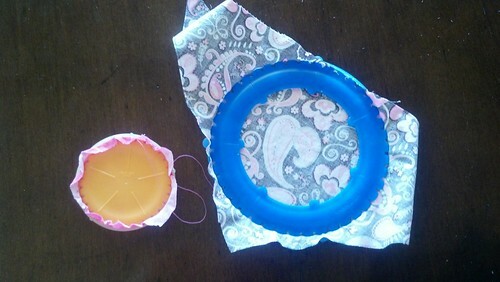 You can also find some great DIY posts on making yo-yos without a form. 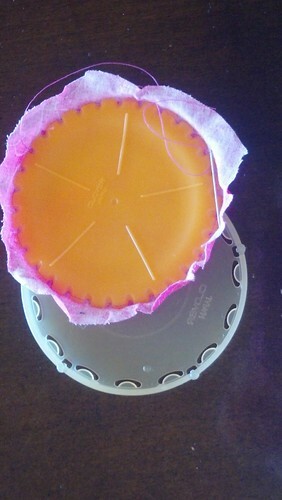 I'm going for the easy route - making yo-yos with store bought forms - gasp! There are two distinct advantages to using plastic forms. 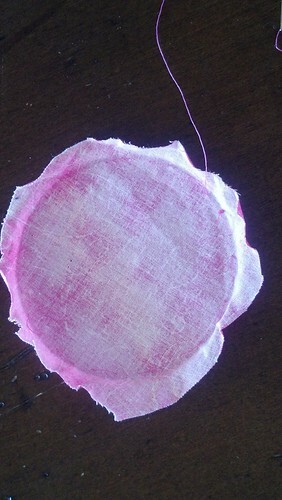 The first one is this: you don't need to cut a perfect circle before you pick up a needle. In fact, you don't have to cut a perfect circle at all. 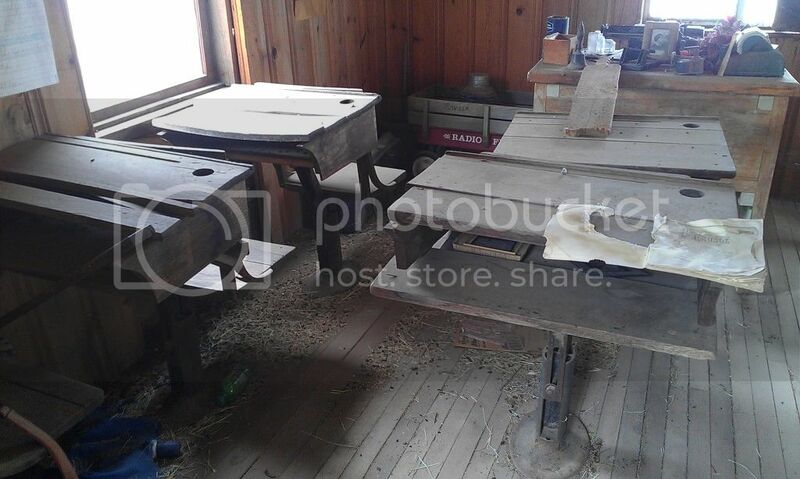 Using the plastic form guarantees a uniform size even with odd shaped scraps you see above. 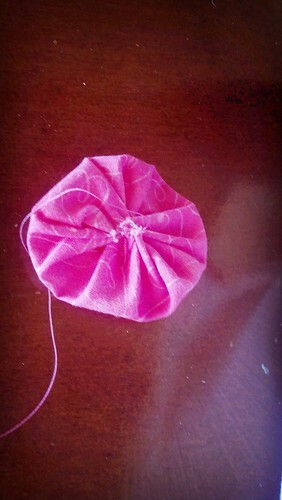 You don't have to cut the circle until after the fabric is firmly held in the form. 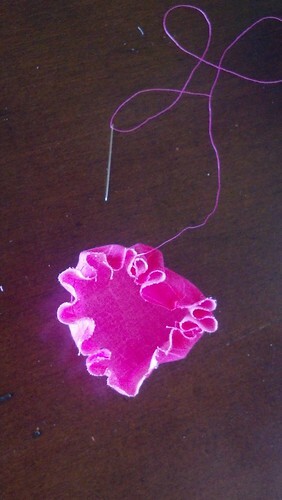 Once you snap the fabric into the form, it's time to start sewing. Here's the second advantage. 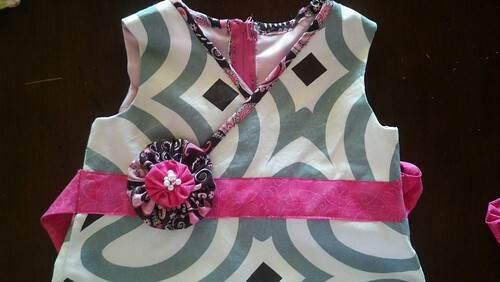 You don't have to worry about sewing perfectly spaced uniform stitches. 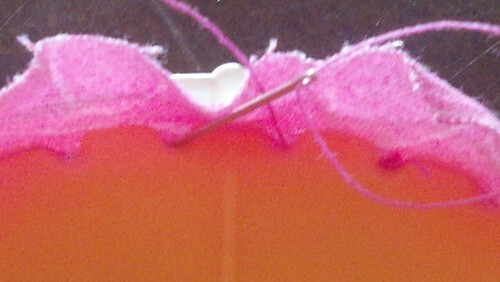 The plastic forms have little notches in them so you can sew in and out of the notches to get perfect stitches. It's a great activity for kids. Pull the thread evenly and watch the circle come together. Tie off the end and you have your first yo-yo. I really want to make some of the cool projects you can see if you look at the Google images, but I haven't made nearly enough yo-yos for that. However, when I was recently making a little dress, I decided to use two different sizes of yo-yos with some little pearls I bought as an embellishment. I'm Selling Me Some Scentsy! 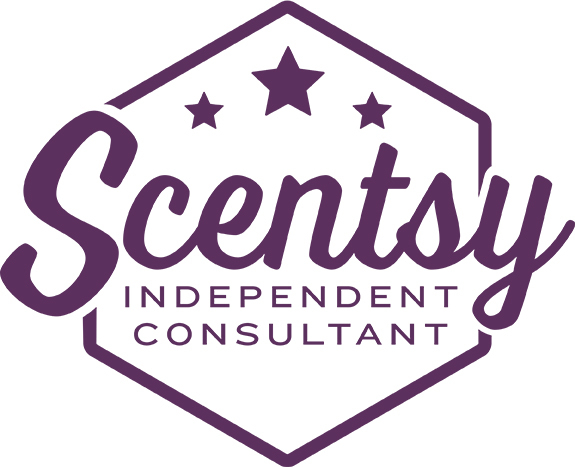 That's right - I am now a Scentsy Independent Consultant! Why? Don't I already have too much to do?? (yes) There is a simple answer - I LOVE this product! I originally wrote about Scentsy in this post from December, 2011. That's when I discovered this awesome scent system for the places you live your life. 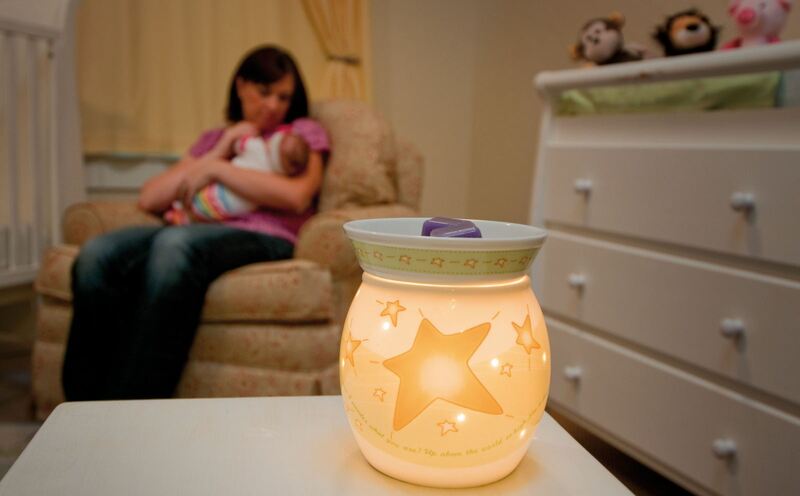 The basic Scentsy product is a "warmer" in which scented wax is melted using the heat from a 25 watt bulb. 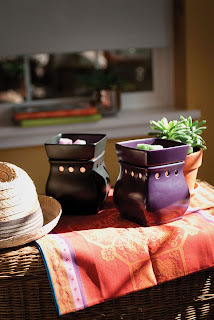 Scentsy warmers also come in plug in versions. The scents are amazing and I love the fact that this is a safe product - no candles that can cause fires. You can leave a warmer on for days without fear of overheating. If that was the entire Scentsy product line that would be great. 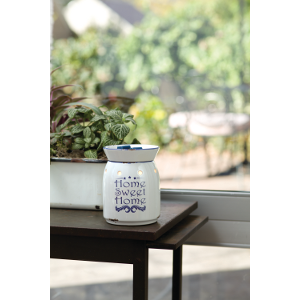 However the company also produces products so you can take the scents wherever you go without a warmer. 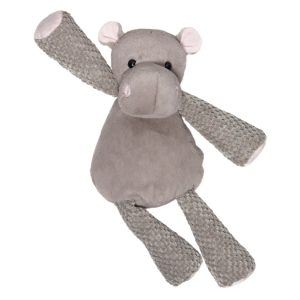 Scentsy makes room sprays, scent packets (think sachet), stuffed animals (with scent packets inside), scent circles and travel tins for your car. 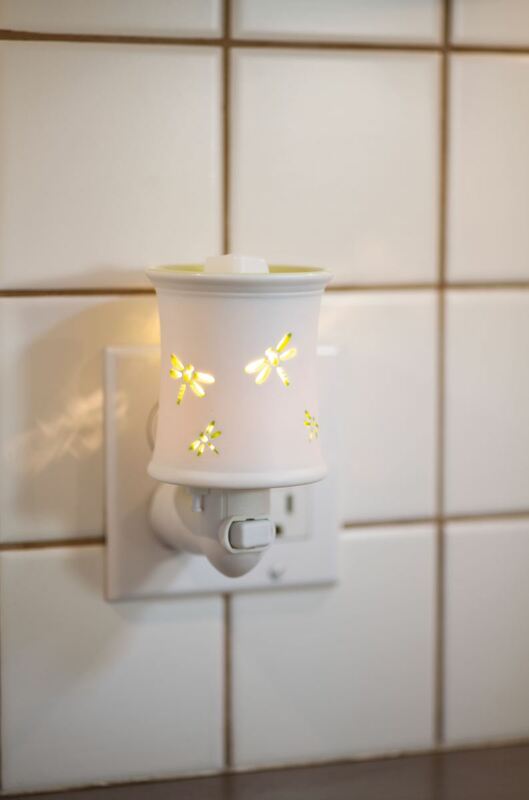 Scentsy recently introduced its Layers line of products (sprays, shower gel, perfume, lip balm, body lotion and laundry products) so you can wear your favorite scents. The key to Scentsy is the scents. There are more than 80 scents available in "bars." With a bar, you can break off and use as much or as little as you want, depending on how strong you want the scent to be or based on the size of the space where the warmer is located. The scents are the things that initially drew me to the products and they keep me coming back. 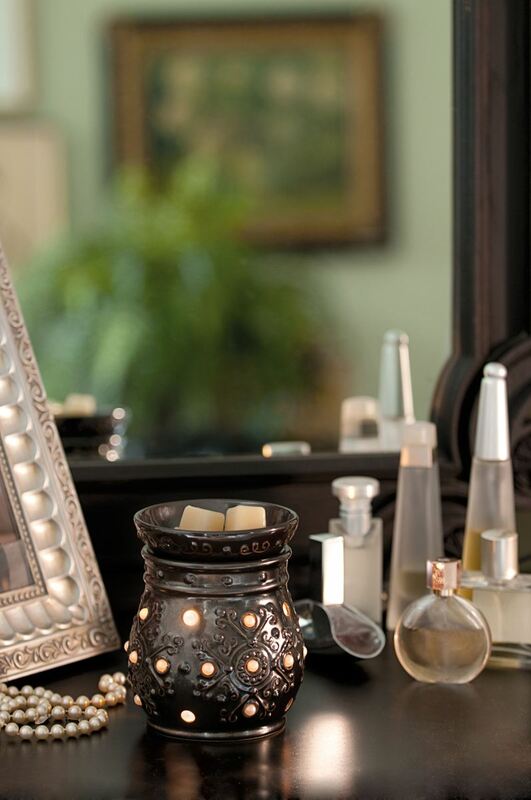 Scentsy creates products to keep beautiful scents in every part of your life. Imagine this: you wake up in the morning to the soft smell of "Quiver" in your bedroom warmer. You move into the shower to bask in "Sweet Pea and Vanilla" shower gel and body lotion. Breakfast is cooking in the kitchen with the yummy smell of "French Toast" and you leave your home breathing in the relaxing scent of "White Tea and Cactus." I work outside of the home, and my commute is better with the fresh smell of "Ocean" in a travel tin or scent circle. My office has a mid-size warmer with the soothing scent of "Black Raspberry and Vanilla." A man's office or den might have the deep, manly smell of "My Dear Watson." You can return home at night to the smells of "Clean Breeze" which smells just like clean laundry (which is great, especially if you are too tired to actually do the laundry). Or, you can do the laundry and use one of the washer or dryer products to add your favorite scent to your clothes. The next morning you can wake up and do the whole day again with entirely new scents - you don't have to wait until the previous smells are "used up." Speaking of "used up," did I mention that Scentsy bars last a LONG time? A single $5.00 bar can last for months, and if you kept a warmer constantly on for days using only a portion of a bar, you would still have the scent lingering through the room. Sorry for gushing, but as I said at the beginning, I LOVE these products! Ready to know more? 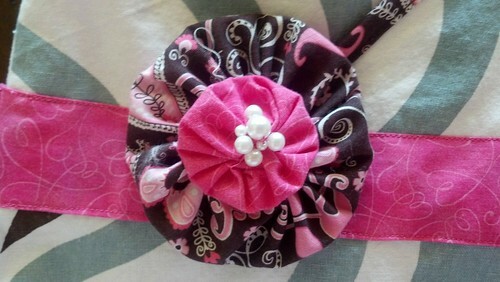 Check out the catalog and drop me an email if you would like to order, or better yet, host a party! You don't have to live close to me in Arizona to host a party and you don't even have to have your "guests" gather in a specific place at a particular time. You can host a "basket party" by using catalogs I provide and taking orders during a defined period of time. If your "party" has at least $150 in sales (not very hard to do), you will get free shipping to your location and hostess discounts! 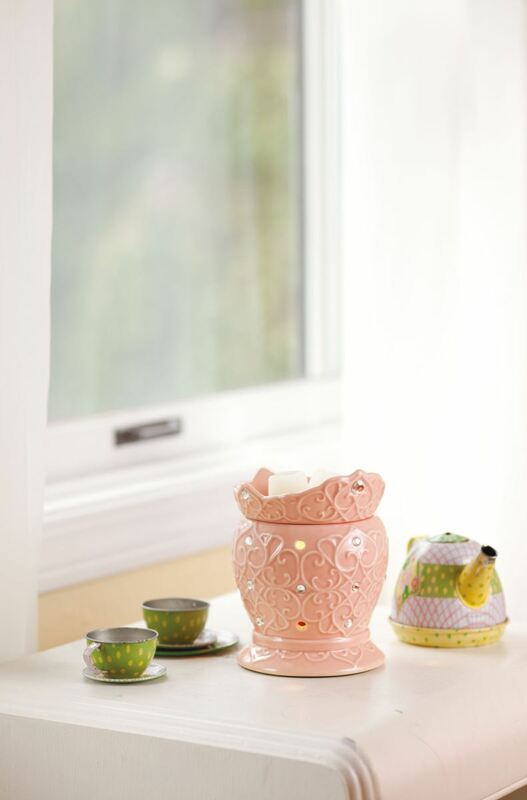 Bring beautiful scents into your life with Scentsy. Please note: although I am a Scentsy Independent Consultant, I have not been compensated in any way for my endorsement of the Scentsy products in this post. The post is not sponsored by Scentsy and the opinions expressed are my own. 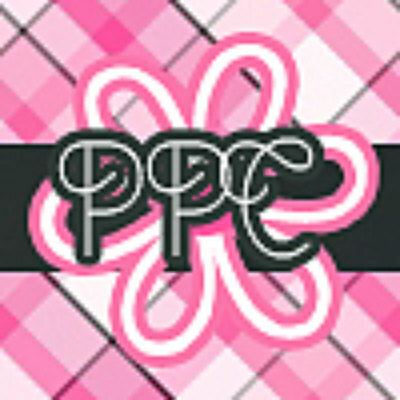 The images above are copyright protected by Scentsy and have been provided for my use. It's been a wild, dizzy week that feels more like a month. Boston. West, Texas. Ricin. The crazy weather in our Midwest hometowns. Personally, I'm also trying to wrap my head around the sudden death on Monday of a former coworker who was one year younger than me and left two young children and a distraught wife. 1. Pray, pray, pray. This is great for every situation. No matter what your faith background is, you can call out each of these tragedies by name. It's the most powerful tool you have. 2. Give financially. The injured in Boston are in for a very long ordeal, especially if they have lost a limb (as so many have). Prosthetics are very expensive and not always covered by insurance. Modifying a home is seldom covered by insurance, nor is modifying a car. There are two established "crowdraising" websites designed to raise money for various causes - Give Forward and Go Fund Me. On Go Fund Me, Boston victim funds are categorized under Believe in Boston and on Give Forward you can find the individual funds on the Boston Marathon Support Page. These are legitimate funds - you can read on each site the respective safeguards. Officials in Massachusetts have also set up a fund - The One Fund. Thankfully, all of the efforts are proving successful, but there are plenty of costs to cover. Likewise, the folks in West are in for the long haul. As of the time this was written, the death toll stands at 14. The people who lived in the apartment complex probably lost everything and don't have insurance. There are over 50 homes to rebuild. Saddest of all, many people will have to bury their loved ones, many who were volunteers but also the main income for their families. Although God cannot be outdone in generosity, folks in Texas are the first in line. I found so many places all over Texas that are finding ways to support little West. It took a while to find information that could be used for people outside of Texas, but I finally found a great list on a local news page. You can find the list here. Get your kids involved and do a little fundraising. 3. Support the Red Cross. They provide disaster relief whenever it is needed, including in Boston and Texas. The Red Cross does not provide long term medical or housing assistance, but it's great to know they are there, ready at all times to respond immediately. You can find more information about how you can help the Red Cross in a number of different ways by visiting their website. Have you ever thought about giving blood? While the victims in Boston and West don't directly benefit at this point, the local blood banks and Red Cross are somewhat depleted. You can help even if you are not close by. If you've never given, it's not that hard - give it a try! 4. Send your best. Write notes and letters, online and in person. This is also a great activity for children who might feel powerless (don't we all?). I heard a volunteer EMT in West say he received so many calls from around the world and it meant so much to him to know even strangers care. It's always so heartbreaking when tragedy strikes. We feel so powerless. Our children are confused. Our perception of goodness in the world might even be shaken. Don't wait for someone to ask you directly. To quote the advertising slogan, "Just do it." 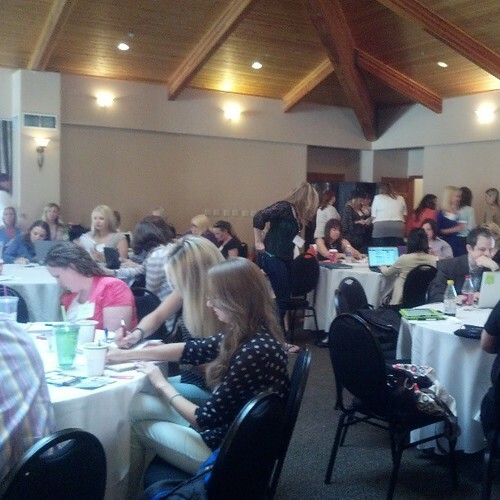 Another fun day at Bloggy Boot Camp at the Zona Resort in Scottsdale. 10:00 a.m. Kerry Gorgone did a presentation on Law for Bloggers. I've been an attorney for 20+ years, but this stuff was exceptional (and frightening). Very intimidating if you want to work with a sponsor. 11:00 a.m. Kelly Loubet talking about social media specialist jobs. Interesting to know that companies hire people just to do social media for them. I just thought the PIO does this. She also showed us how amazing she really is, sharing her (insane) schedule to have everything. Kimberly Sneed A Night Owl Blog who included washi tape on her card to advertise her new blog, The Washi Blog where you can find crafts made from wash tape! Isn't that clever? Alli Ward from Stiletto Pumps & Baby Bumps who had a cute little card featuring a baby in giant sunglasses. Wendy Walker Cushing who featured her beautiful self on both sides of her card (of course with a hat) to advertise her blog Wendy's Hat. So fun! 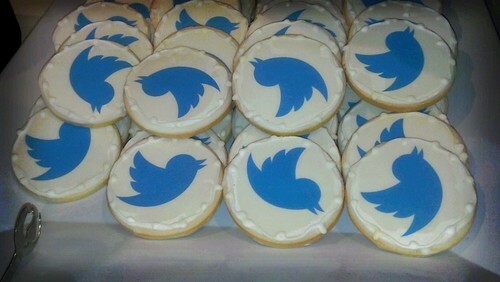 On Day One we had YouTube and during the break on Day Two we had Twitter cookies! Cool. The last two presentations I saw were all about SEO optimization and Google+. These really blew my mind and will take some time to integrate. 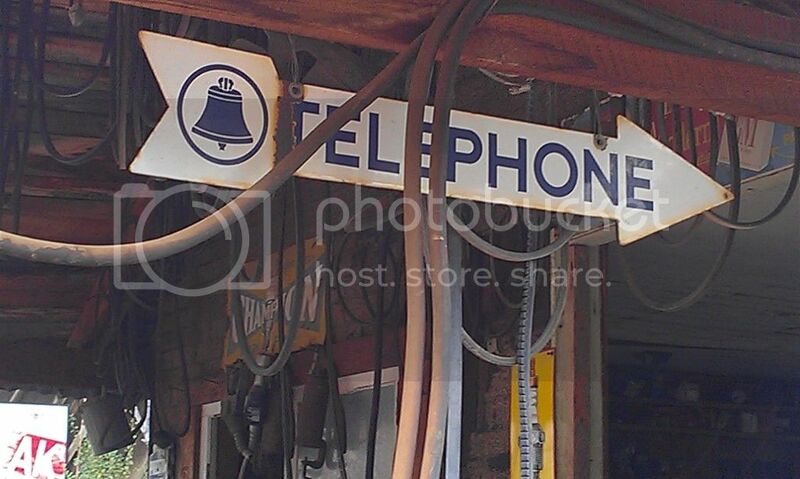 The Google+ information was especially helpful (thanks Lynn!). If you go look at my Google+ profile, bear with me - I'm still working through all the advice and implementing the suggestions. Unfortunately, I had to leave later in the afternoon and that was disappointing, but I still enjoyed and learned so much during Bloggy Boot Camp. In fact, my head was reeling with so many ideas and tons of information! I'm still not sure I was "qualified" to be at this advanced weekend, but this humble blogger was so impressed with the professionalism and drive of all of these hard-working women. Thanks to Tiffany and Fran (the SITS Girls) for creating this great weekend. 8:00 a.m. It begins today. 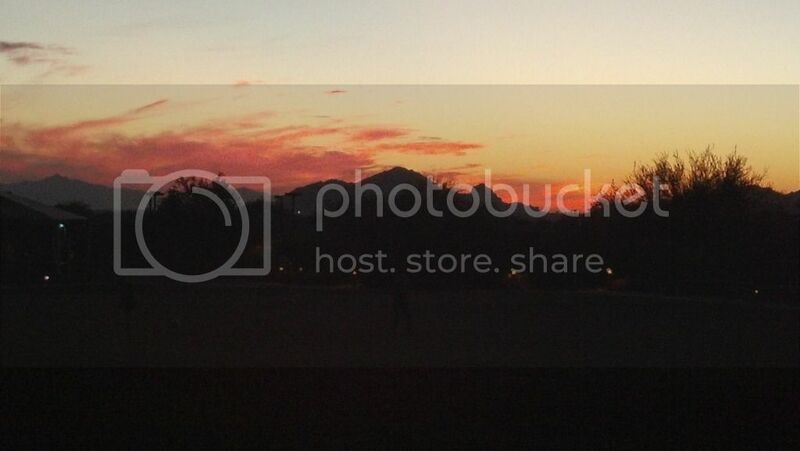 BBC in beautiful Scottsdale, Arizona, my home. It's my first and I'm a little nervous. My dear friend was supposed to go with me, but at the last minute she discovered her adoption journey was speeding up. (see my previous post). So, I'm going to a new forum, not knowing anyone, not sure this blog is "big enough" for this more advanced conference. Sounds pitiful, right? On the bright side, I've been to lots of professional conferences where I don't know anyone. How scary can it be? 2:00 p.m. Ready for the conference to begin. Got my name tag and table assignment. Our lovely hostesses Tiffany and Francesca the SITS Girls welcome us. We get the official hashtag for the conference #bbcphx. 2:30 p.m. First session from our keynote speaker Missy @verymissy (everyone here uses their Twitter handle as her name). She introduces us to branding - very interesting. One of my table partners, Joyce from Dragonfly Creative Design Studio is hearing impaired and her poor husband is using sign language to interpret. Problem is, Missy talks REALLY fast. He's holding his own. 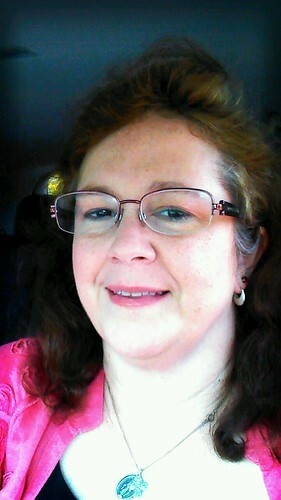 4:00 p.m. Now that my world is rocked by the possibility of working with PR firms, we hear from Kim Byers @celebshoppe. She talks about the 5 Secrets we need to monetize our blogs. Great talk. I especially like the emphasis on loving what you blog about. The tweeting is going fast and furious all around me. I especially like reading the tweets of people at my table - it's like telepathy because I can read their thoughts and their mouths aren't moving! 5:45 p.m. Beth @bethanimalprint is here to talk to us about YouTube. This is a very good talk - too bad it's at the end of the day which is running late. The cocktail party was supposed to start at 6:00 p.m. and eyes are wandering out to the patio where the bar is being assembled. Beth tells us all about the YouTube Partners Program. YouTube helps you set up your own channel and create the best videos for your branded blog. It's obvious most of the people in the room don't have much experience with YouTube other than watching cat videos. It's too bad because YouTube is a fabulous place to advance a blog. 6:30 p.m. Time for some drinks and appetizers! Tiffany reminded us after the last talk that we're having dinner after the cocktail hour. WHAT?!? 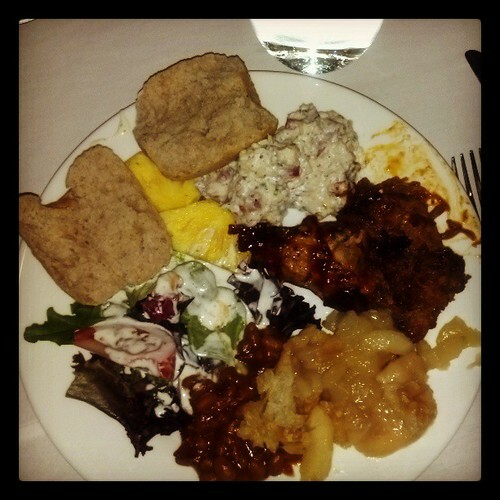 Many of us didn't remember that dinner was included in the price of our ticket to the conference. BONUS! By now I have collected over 25 business cards. I ran out of my cards before 5:00 p.m. (note to self - must bring bigger stack of cards tomorrow). Funny thing - I'm used to the "business card shuffle" that each person does at a professional meeting by passing cards around. At BBC, each time we changed tables (which was after every talk), I saw the "business card shuffle." At a blogging conference! Cool - something that was in my comfort zone. 7:15 p.m. Dinner - very yummy. I finally found my niche for the day sitting with some very lovely ladies during dinner. They are members for the Generation Fabulous group (or "tribe" to use the word flying around today). I realize that while the women talking about Huggies diapers are cute, I really identify better with these "mid-life bloggers." I had a wonderful dinner and actually met some people I know more by their first names than their Twitter handles. 8:45 p.m. Our little dinner group finally breaks for the night and we're one of only two tables left in the room. As I drive home, I'm feeling a little less overwhelmed and looking forward to tomorrow. I think I'm going to take the information for what it is - advice on monetizing/branding/promoting my blog and then decide later whether it's applicable to me. Yesterday I completed some paperwork as a reference for a very dear friend. You see, my friend and her husband are about to adopt a little boy, but they still need the blessing from the state. While it wasn't hard for me to say nice things about them, how do you convey a miracle? My friends have two beautiful children, but for a long time now they have had a little hole in their hearts where a little person needs to be. They tried very hard to have another baby and almost filled that void many times, but it just wasn't God's plan for them. They prayed the little person was out there somewhere, but the prospect of adoption was daunting, especially considering the lack of little ones to adopt. Then a little boy just appeared out of nowhere. That sounds like an exaggeration, but it's the beginning of a series of miracles. Question: How will this couple react to the addition of a child in their home? Answer: They will love the child as a gift from God because he was given to them. Here's the story: Another close friend has a co-worker who inquired whether she knew of a good Catholic family that might be interested in adopting a baby. Evidently, the co-worker is a relative of a woman raising her toddler grandson. Grandmother is not equipped to do this and is convinced the child would be better with a complete family. Close Friend #2 immediately thought of my very dear friend and put them in touch with the Grandmother - the BIG miracle #1. Question: Please describe the values and morals of the adoptive couple. Answer: They trust God with all their hearts and know He will do what is best for them. Period. Question: Are the prospective parents prepared to provide a stable environment for a child? Answer: They have been ready, willing and able for a long time, but now it's happening so fast it's almost too good to be true. Anyone who has been through an adoption knows it takes a long time - sometimes years. My dear friends knew they already had a miracle in a little boy who found them even before they were looking, but they were guarding their hearts so they wouldn't get hurt. Ready for Miracle #3? The biological mother not only signed away her parental rights, she did so with an explicit condition that the baby go to my very dear friend and her husband. Grandmother was ready to let the baby spend quality time with his new family. The entire process from Miracle #1 to #3 has been a few months. That is a miracle unto itself. 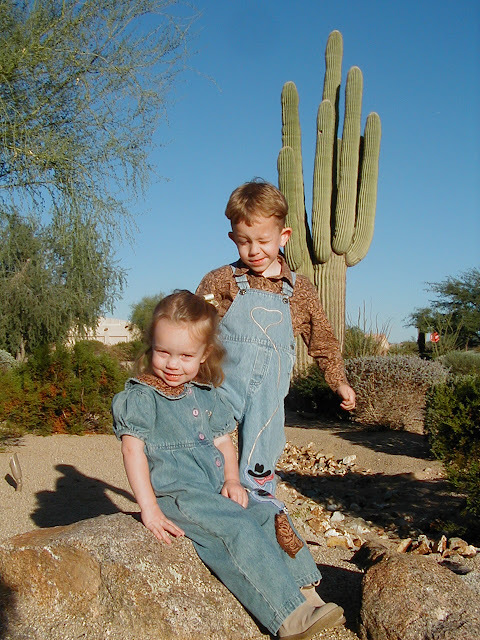 Question: Do you know of any reason why these prospective parents should not be eligible to adopt a child? Answer: Are you kidding me? If you don't believe this is the right child for the right family at the right time, you're not paying attention to the story. While the story has not [quite] ended, I am confident it will end with a happy family of two parents, two siblings and one very lucky little boy. God is good - all the time. This giant saguaro was in our front yard when we bought our house 11 years ago and it was standing for well over 100 years in the same spot before the house was built. It was about 35 feet tall and defined our front yard. It was the background for Christmas cards and Easter egg hunts and the foreground for many, many pictures of rainbows and blue skies. It is survived by its smaller twin, but it's just not the same. It doesn't really matter what brought it down, but evidently it was an internal infection. These giant saguaros live for hundreds of years, but when a cactus wren (think woodpecker) makes a hole in them for bird condos, it opens a wound that can never heal. For our giant silhouette, it came down without anyone here noticing. Kent just looked outside during the day and it was stretched out on the ground. 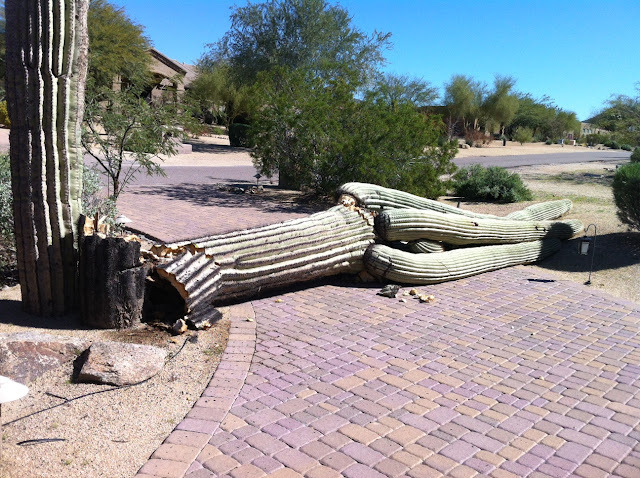 I know it was a plant, but it sure felt like part of our Arizona story. RIP old friend. Last Labor Day we spent a beautiful weekend in the Verde Valley in central Arizona. 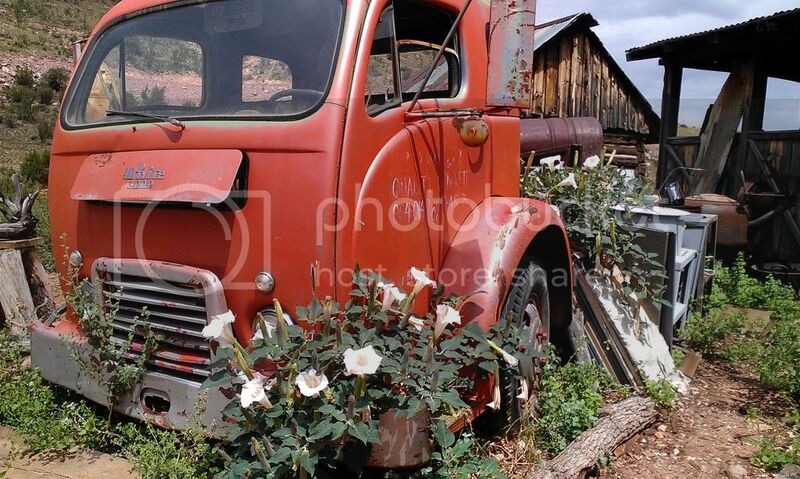 Tonight I found these pictures and realized I never wrote about lovely Jerome, Arizona. 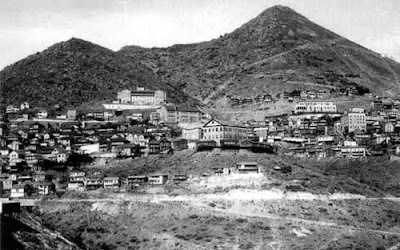 Jerome is built on the side of a mountain; in fact, it's gradually sliding down the mountain. Why would anyone build a town on the side of a mountain? 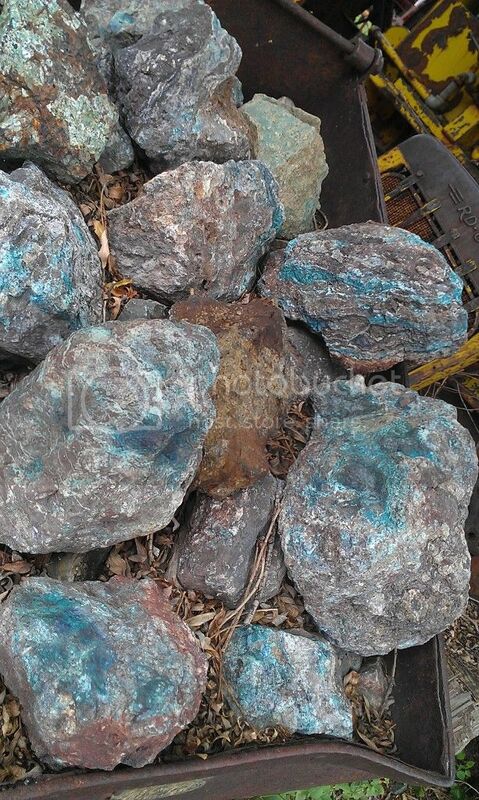 Copper of course. Jerome has been basically mined out for some time, but the town remains and is so fun to see. 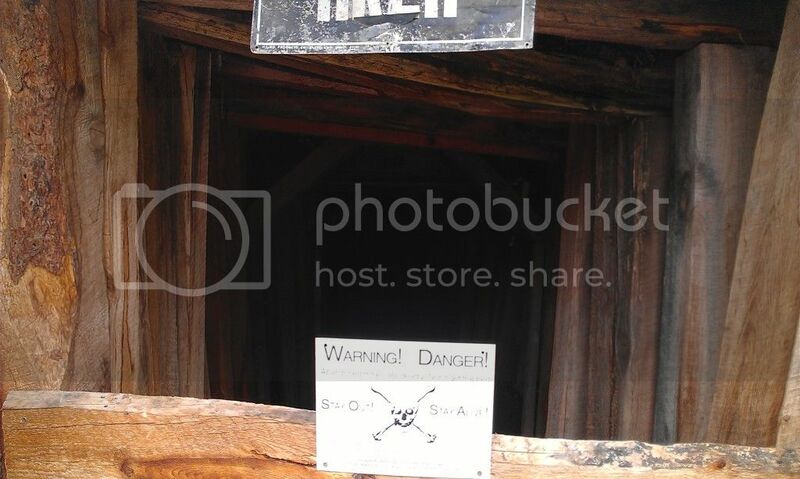 One of our stops was a "ghost mine" that could be better described as a mining junkyard. It's a glimpse into another time. 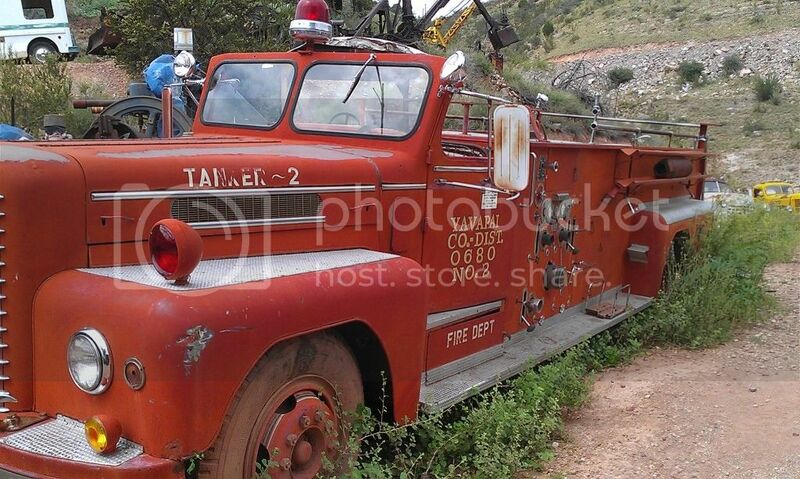 Back in the late 1800's to early 1900's, mining towns in Arizona would spring up, flash like a flame and then be abandoned like a spent match left to stand exactly where it was left. 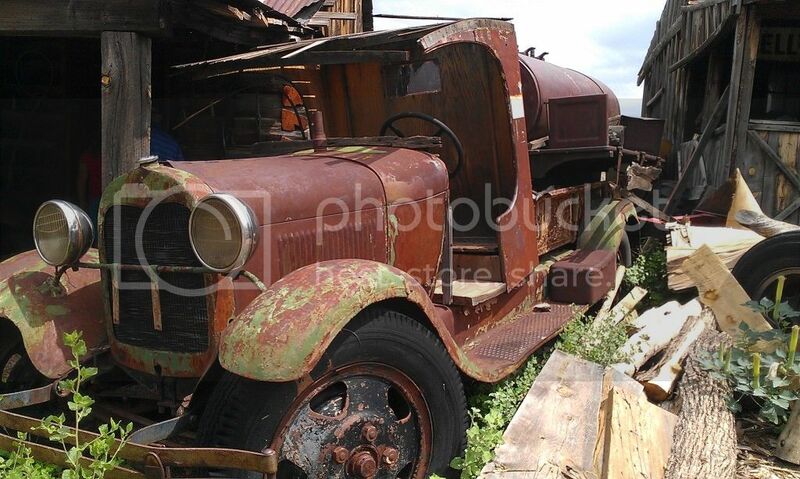 It makes you wonder who drove these cars and how copper mining touched their lives. Copper - one of the "5 Cs" of Arizona - Copper, Cotton, Citrus, Cattle and Climate. 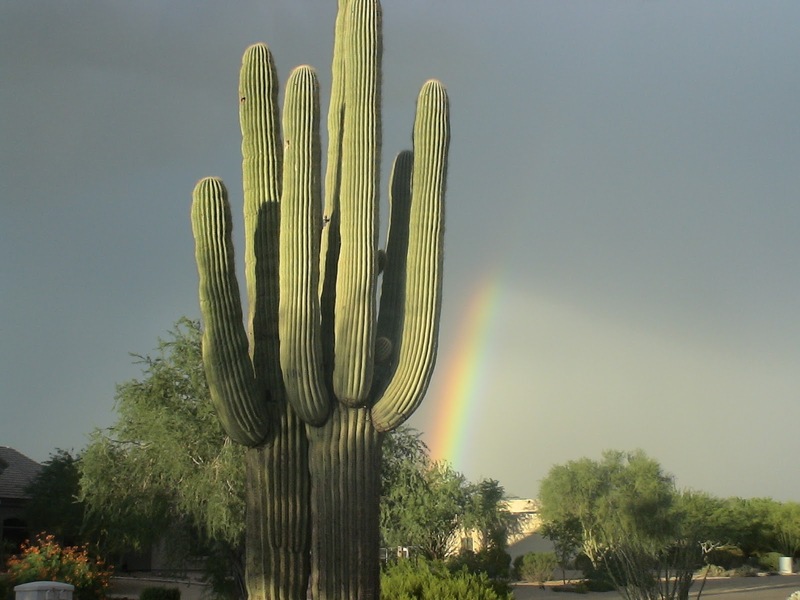 The Five Cs built and fuel the Arizona economy, with copper being the primary engine of prosperity. 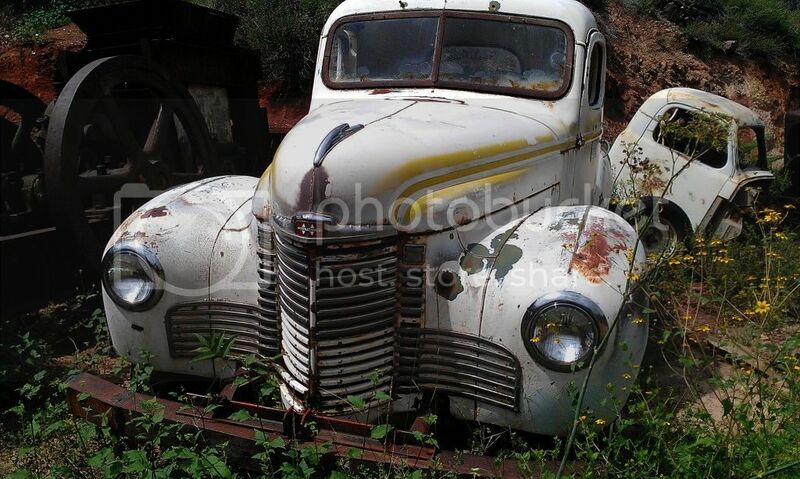 It leaves towns and lifestyles in the dust as it sweeps though. Jerome is one of the best examples of that. One of the things I worried about when I was gone was losing traffic - the fear of every blogger. When I came back yesterday, I was really surprised to see my numbers were doing well, maybe even increasing a little. I also noticed I had a bunch of comments which is unusual for me - uh oh. I am the victim of spammers. These are people (more likely machines) that spread their spam all over the blogoshere looking to promote websites, or worse yet, phish. There is nothing like seeing links to websites from China, Russia or Ukraine (hello to all my hacker friends overseas). Anyhoo, I thought the comments were interesting enough to share, especially when you consider the post to which they are attached. I omitted the website or hyperlink description - the remaining link is to my blog post. Yes, I will now be using a comment moderator, but I may find I'm missing kudos.